Maruti Suzuki’s Ignis is a compact crossover; simply, a hatchback with some SUV like traits. This small Maruti is designed to appeal to the youth and has been styled and designed to be attractive and affordable. With India expected to have one of the youngest populations by 2020, manufacturers are scrambling to create fresh products and a new purchase and ownership experience for the younger audience. Despite arriving late to the segment, Maruti has proved with the Vitara Brezza that they understand the pulse of the Indian market. Now the carmaker is ready to win over both, young and SUV-crazed buyers with the all-new Maruti Ignis. Design, technology, safety and practicality, Maruti has tried to balance these aspects carefully in the Ignis. Ample cabin space for four occupants. Healthy amount of headroom and legroom on offer. Healthy 180mm ground clearance lets you tackle a bit of rough roads. High seating position. Gives a commanding view of the road ahead. Centre console of mid-spec variants (without touchscreen) looks a bit awkward. Top-end Alpha variant cannot be had with the AMT. Big miss! Quality of plastic used inside the cabin are slightly hard. The light white colour is likely to get dirt easily too. The Ignis’s design makes it stand out, but it may not appeal to everyone; and the rear is sure to put people off. On the inside too it looks young and fresh. Contrasting black and white colours for the plastics makes it look even more striking. The cabin is spacious and practical for four adults. It even feels more solid than some other Marutis, but it doesn’t look as well finished as other Marutis. Petrol and diesel engines combined with automatic transmissions makes the Ignis a great fit for the city or for more open roads. The Ignis’ variants are a bit oddly stacked. Driver’s seat height adjust is only offered on the top end variant, as are the LED headlamps and DRLS. However, the automatic transmission options are available only on the Zeta variant. Also, the Ignis does seem pricey. "When you factor in the class leading features, the standard safety package, the Ignis proves to be better value than what it appears at first." However, when you factor in the class leading features, the standard safety package, the Ignis proves to be better value than what it appears at first. 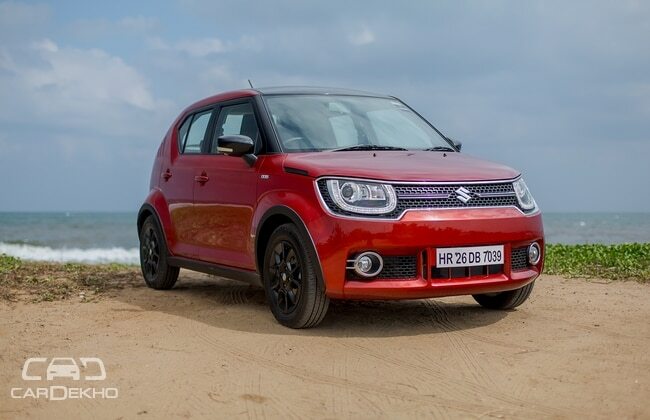 This isn’t your traditional Maruti in many ways, but those looking to buy one will find the sensible and practical Maruti traits make the Ignis an appealing package. Love it or hate it the Ignis’ design, you can’t ignore the Ignis. On the size front, it isn’t imposing or intimidating. The Ignis is, in fact, shorter than the Swift in terms of length and is just as wide. It is, however, taller and has a larger wheelbase too. The biggest draw here is how unique and distinctive it looks compared to any other Maruti or anything on the road overall. There is an overall square and upright stance to the design that gives it a rugged feel. Up front, it sports a quirky front grille that envelops the fascia like a mask. Everything from the headlamps and badge sits flush in the front grille, with the clamshell bonnet sitting tall above. Chrome strips give the Ignis some flash value, but these are offered only on the top two variants. Also, the LED headlights, a feature that cars several segments above don’t offer, are available on the top end Alpha variant. The Ignis has a tall-boy stance nut gets beefy cues like flared wheel arches and a chunky C-pillar. It’s a funky retro-modern blend and while you get a stylish and spunky set of 15-inch wheels (alloys on Zeta and Alpha, steel on lower variants). The lower two variants do without the rugged looking cladding for the wheel arches and side sills too. The chunky C-pillar has three slashes on it - a throwback to the Suzuki Fronte Coupe which, incidentally, was a body-style of the Maruti 800’s forefather. Like the front, the rear too has an angry look, but it isn’t intimidating thanks to the Ignis’ petite proportions. A plus-sized set of tail lights, along with a black insert in the rear bumper make it distinctive and practical too. The Ignis will be available in 9 colour options, including 3 dual-tones. Maruti Suzuki will also offer the iCreate customization packages, so owners can personalise their Ignis to their taste. In terms of dimensions, the Ignis is 3,700mm long, 1,690mm wide, 1,595mm tall and its wheelbase measures 2,435mm. On the inside, you’ll notice how clean and seamlessly the design is. The Ignis’ cabin features an airy, functional and minimalistic layout for the cabin. The dashboard itself seems to have been styled like a clam with the upper and lower half separated by a thin slit in the middle that houses the AC vents and a little storage space. The Delta variant and above get a two tone black and white dashboard, which this looks nice and techy. But, bear in mind that white interior trims tend to get soiled quite easily. What’s really likable is the fact that we’ve never seen a cabin like this in this class. For example, there’s isn’t any centre console as such. The Delta and Zeta grades get a 2DIN music system, while the Alpha variant gets a free-standing 7-inch touchscreen infotainment system with Apple CarPlay and Android Auto, while the air-con controls sit independently below. Automatic climate control is exclusive to the top-end Alpha grade, while the others get a manual HVAC system. That said, there’s plenty of storage space between the front occupants, so practicality hasn’t taken a backseat for the sake of aesthetics. The steering wheel is entirely new as well and gets mounted controls for audio and telephony on the Delta and above. The instrument cluster is all-new too and features two analogue dials along with one digital MID to the right. The MID is quite detailed too and includes two trip meters, the time, ambient temperature display, instant and average fuel economy displays and more. This is a small car, but it is quite spacious. Thanks to the tall boy design, headroom is in plenty and there is enough legroom and knee room on offer too. However, the rear bench may be a little cramped for 3 occupants. What’s more, the rear doors open really wide, making ingress/egress easier. There’s a good amount of boot space available too (260-litres) and short weekend trips with the family and their luggage can be managed with ease. The Ignis is available with a familiar set of engine options, yet has something unique to offer too. Both, the petrol and diesel motors are shared with the Baleno, and while a 5-speed manual gearbox comes as standard, both engines can be had with a 5-speed automated manual transmission (AMT) as well, though the option is only offered on the Delta and Zeta variants. Powering the petrol Ignis, is the familiar 1.2-litre K-Series engine, that produces 83PS of power and 113Nm of torque. The engine has proved its mettle in cars like the Swift, Dzire and the Baleno - and it feels no different in the Ignis. The motor is smooth, refined, and loves to be revved! Yes, it can be quite a hoot to drive too, thanks to the Ignis’ low 865 kg kerb weight. The 5-speed manual is slick-shifting, with a positive action backed up by a light clutch. There’s just the right amount of punch in the low- and mid-range, which makes the petrol-powered Ignis quite a city slicker. The automated manual transmission (AMT) does a swell job of swapping cogs, too. The shift-shock and head-nod gremlins are kept well within check, as the gearbox goes through the gears. There’s a manual mode as well, but we rarely used it. The transmission keeps the motor on its toes, and doesn’t hesitate to drop a few gears if you go right-foot heavy. The 1.3-litre DDiS190 engine finds itself in the engine bay of the diesel Ignis. Output is rated at 75PS and 190Nm, which seems aplenty for a car the size of the Ignis. The characteristic turbo-lag under 2000rpm remains the only sore point of the engine. Get the turbo spooling, keep the motor in the meat of its powerband and it impresses. Once past 2000rpm, it pulls cleanly (and strongly) to its 5200rpm redline. What’s more, it gets an ARAI-backed efficiency of a whopping 26.80kmpl (Petrol = 20.89kmpl). The bigger talking point, though, is the diesel-automatic combo. The Ignis is the only diesel hatch under Rs 10 lakh, to sport an automatic transmission paired to an oil-burner. The engine-gearbox combo is the same we’ve seen on the Swift Dzire AGS, but there are a few tweaks to the gearbox software to make the experience a tad slicker. Just like the petrol, the AMT shifts through the gears quickly, and you wouldn’t notice a shift till you look down at the MID. What does take some getting used to, is the fact that the Ignis diesel AMT continues to lunge forward for a second or two after you have lifted off the throttle. Ride and Handling The power-steering on the Ignis is nice and light at city speeds. Parking, zipping across traffic and making a quick u-turn shouldn’t be bother at all. Take it out on the highway, and there’s enough weight to keep you confident when the speedo shows triple digit speeds. The Ignis isn’t meant to be a hot-hatch, so do not expect razor-sharp steering manners and feedback. That said, it does get its job done without a hiccup. The 180mm of ground clearance means you can be a bit adventurous and take it over broken roads. Grip from the 175/65 R15 tyres seem adequate, and the suspension is tuned well to offer a comfortable ride. It manages to take the sting out of the nasty potholes, and tides over them with a sense of maturity. And, just like its elder sibling - the Baleno - the suspension is quiet while doing so. There’s no thudding or thunking that makes you cringe inside the cabin. Out on the highways, it maintains its poise and feels planted at triple digit speeds as well as quick lane changes. Built on the Fifth Generation Platform, the Ignis has a lot of safety built into its platform. The Ignis is said to be compliant with upcoming Indian crash test norms. It is also designed keeping pedestrian safety norms in mind. Maruti Suzuki is offering the Ignis with dual airbags, ABS with EBD and ISOFIX child seat mounts as standard across all variants. Opt for the Delta grade and you get a security alarm too, along with adjustable rear headrests. The Zeta grade adds rear parking sensors, plus a rear defogger and wiper, while the top-end Alpha variant gets a reversing camera too. The Ignis is available in four variants - Sigma, Delta, Zeta and Alpha.